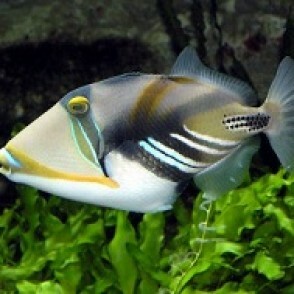 The Humu Picasso Triggerfish, also known as the Humuhumu Triggerfish or Picasso Triggerfish, has a wacky, painted appearance. 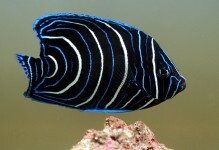 It has a tan body with gradient dark bands, and vibrant blue and black stripes on the top of the head, with a yellow stripe from cheek to cheek and deeply set-back eyes. 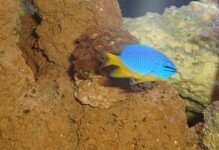 A 180 gallon or larger aquarium with rocks and caves provides a good habitat. It will rearrange the landscaping and rocks as it wanders in and out of the caves. 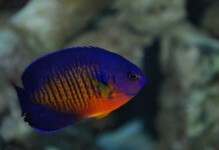 It vocalizes using a “grunting” sound. 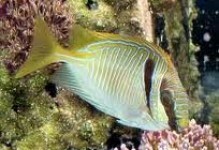 The Humu Picasso Triggerfish makes a great conversation piece. 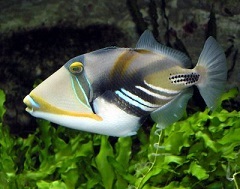 The Humu Picasso Triggerfish needs a varied diet of meaty foods including; squid, krill, clams, small fish and hard shelled shrimp to help wear down their ever growing teeth.